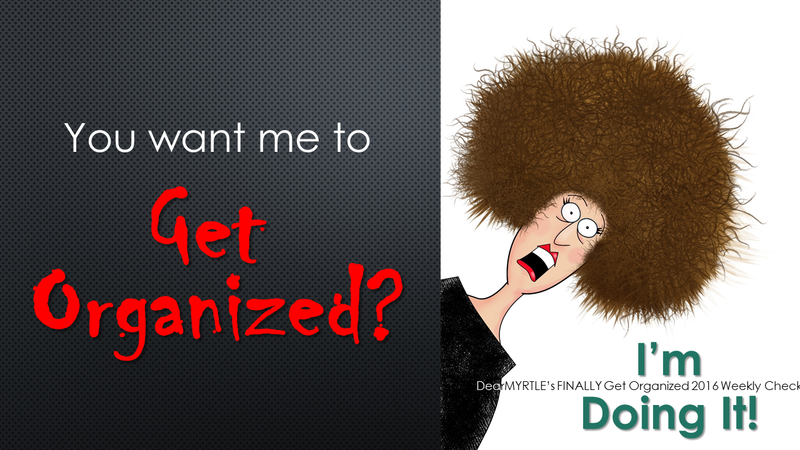 Organized, Me? Maybe with Dear Myrtle’s helps. Pat Richley-Erickson, aka Dear Myrtle, announced that she would beginning her “You Want Me To Get Organized” Sunday 27 Dec 2015 along with Homework. Yes, Homework. Being the dutiful follower I am. I did my homework. I added to her get organized check list my need to review what supplies I needed. I ordered back up printer inks, computer paper, and 5 x 8 index cards. All other supplies appeared to be plentiful. On Monday 28 Dec 2015 she announced Participant badges that can be used on your blog or documents. Tuesday 29 2015 she announced Monthly Awards. The support continues with each of her posts. Wednesday 30 2015 the announcement of One place to look for all checklists . Thursday was a reminder asking us if our Desk are clean, her is. Finally on 3 Jan 2016 Dear Myrtle posted the first true weekly home work assignment. FINALLY Get Organized! Jan 3rd-9th 2016 Checklist and Myrt’s confession . Before I get into the first weekly assignment I will give you an overview of my attempts to get organized to this date. I did Thomas MacEntee’s first Genealogy Do-Over in 2014. I learned a lot doing his 13 week program. I followed his Do-Over in 2015 and will follow in 2016. I blog about them here on my blog site Dame Gussie’s Genealogy Rants. Just check the archives to read them. I came to a decision of what works for me and what doesn’t. With that decision made I feel confident I can meet Dear Myrtle upcoming getting organized challenge. I find the use of Microsoft Word, Excel spreadsheets and digital photos/documents files by Surname the most comfort way to work. I will continue to use my 5 x 8 index cards along with the saved digital records for when I have multiple surnames in a community. For me the visible cards that I can move around is most helpful. I will continue to keep an open mind to new digital options. Having back up of our work is never a bad thing. I have signed up for Thomas’s Boot Camp Scrivener II: Beyond the Basics Mini Boot Camp – Saturday, January 23, 2016. Open Mind! Open Heart! A way to Start! I’m ahead of the game in Dear Myrtle’s checklist. I completed the first two items and partially completed the third. I’m still waiting for my husband to connect my second monitor., until then, I will use my IPAD mini, my IPHONE and dual images on my current monitor. I ordered extra Archival Document Boxes. Computer Desk Set Up for Working. PARTIALLY CHECK, second monitor in the works Books organized. CHECK Will order new books as needed. Patiently waiting for Week 2 Checklist. Next Post Town or County Clerk-Oh, No!